Guernsey, also known as Bailiwick of Guernsey, is a group of islands in the English Channel. It is a remnant of the medieval Dukedom of Normandy, so if you go there, you can visit some medieval ruins. What you will probably like is that the island of Alderney has the highest number of pubs per capita. Some people find that charming. Even so, the area gets a lot of sun compared to the UK, and it possible for you to have a quiet vacation in Guernsey. Exploring the islands may keep you occupied during the day, but during the night, some islands are incredibly quiet. Before you think of visiting Guernsey, you must make sure that you do not need a visa. 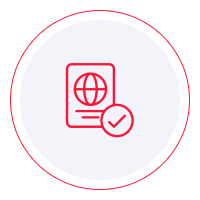 A lot of nationalities are required to get a travel permit. However, it is not a visa per se. It is called ‘leave to enter’ or ‘leave to remain.’ It is important to know that the countries of the European Economic Area enjoy freedom of movement, but the citizens of other countries do not, in which case they need this leave to enter. To receive a ‘leave to enter,’ the applicant must qualify under the Immigration Rules. If you want to learn on which side of the Immigration rules you are, you can study the visa policy of Guernsey. However, we recommend an easier way. The Visa Checker. The toll has been designed by iVisa to help you find out whether or not you need a travel document. The whole thing takes just a few seconds and involves a few clicks. You need to choose your country of origin from the drag-down menu and put Guernsey as your destination. If you do not need a visa, you can move on. If you do, you will be given a list of the embassies you can use to apply. Unfortunately, iVisa cannot help you obtain a leave to enter for Guernsey. Instead, we can provide some information that we think could be of help. That is why our support service is at your disposal 24/7. You do not have to pay a penny for your questions. If you find yourself in the position in which you need a leave to enter, you must inquire about the requirements. You may be able to find what you need on the internet, but we recommend that you call the issuing authority itself. It is the most reliable source of information. Websites are not always brought up to date, and that can lead to mistakes. Just give them a call, and you will find out what you need to know. Nevertheless, what we can tell you is that you need a passport that remains valid for at least another 6 months from the date of arrival in Guernsey. For further information, contact the nearest embassy of Guernsey. We are sorry that information is all that we can give you at the moment, but as soon as the ‘leave to enter’ can be obtained online, we will design an easy and short application process. Until then, we hope that the information above is useful.